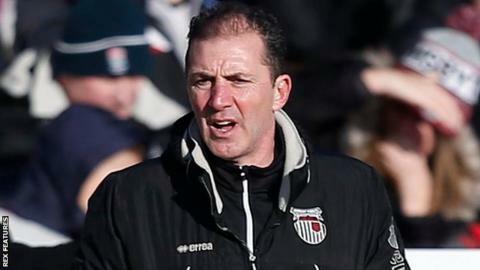 Truro City have appointed Paul Wilkinson as caretaker manager until the end of the season. He previously filled a similar role at Grimsby and Northampton, and has coached Leeds United and Cardiff City. Wilkinson takes over after the National League South club sacked Leigh Robinson and assistant Michael Meaker on Wednesday after seven months in charge. The White Tigers are a point above the relegation zone after only two wins in their last 12 league games. Wilkinson arrives less than three weeks since the Cornish Pirates rugby club took over Truro, with both aiming to move into the planned new Stadium for Cornwall. The 54-year-old played 650 games as a striker in a playing career that saw him feature for Everton, Nottingham Forest, Watford, Middlesbrough and Barnsley. He had a spell as caretaker manager at Northampton Town in 2017 and was in charge for three games at Grimsby last year after Russell Slade's sacking. "He's been head hunted by one of the agents of the Pirates," Truro chairman Peter Masters told BBC Radio Cornwall. "He's got a lot of contacts and was able to come back with a few people who are willing to travel down to Truro for the last six games to help us out of this hole. "I think it'll bring a refreshing change to the dugouts. The players are looking forward to the challenge and they all want to stick with the club and make sure that the club stay up." "We're starting off with a team that can stay up, they just want nudging in the right direction."